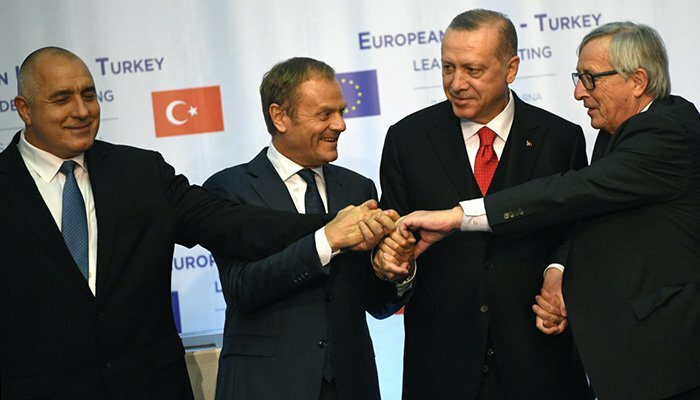 “We hope that under President Erdogan´s leadership Turkey will remain a committed partner for the European Union on major issues of common interest such as migration, security, regional stability and the fight against terrorism,” a spokesman for the European Commission told a regular briefing. A night of triumph for Erdogan saw the man who has dominated Turkey for the last 15 years declared winner of Sunday’s presidential poll without needing a second round and lead his ruling party-led alliance to an overall majority in parliament. Erdogan, whose victory was wider than predicted by many analysts, vowed to “rapidly” implement the new presidential system agreed in an April 2017 referendum that opponents fear will give him autocratic powers and could keep him in office for another decade. “Turkey has given a lesson in democracy to the entire world,” he added, pointing to a turnout of 88 percent. His main rival Muharrem Ince of the Republican People’s Party (CHP), who had challenged Erdogan with an energetic campaign, broke an uncharacteristic overnight silence to declare on Monday he accepted the results. “I accept these election results,” Ince said, adding Erdogan should “represent 80 million” and be “president for us all”. “This election was unjust until the results were announced,” he told a news conference at CHP headquarters after ordering out crews from state-run TRT over their campaign coverage.